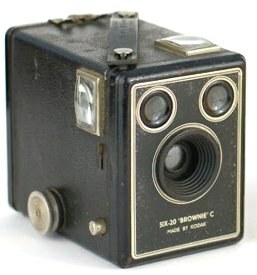 A Kodak Box Brownie camera. Hardly any of the pictures I took on my Kodak Box Brownie have survived, but not only do I still have the next camera that I got – a Yashica-A twin lens reflex camera – but I also still have a large number of the black-and-white photographs that I took with it in the late 1950s and early 1960s. Although I don't use the Yashica these days, I must admit that it served me well: the first photographs I ever had published (of the Drakensberg mountains in South Africa and what is now Lesotho) were taken with it. 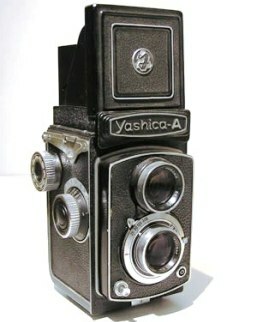 A Yashica-A twin lens reflex camera. Shortly after acquiring my Yashica, however, I also acquired my father's Lordomat 35 mm camera. I got it in the way that children so often get things from their parents: in the first instance, I borrowed it in order to use it on my 1959-60 hitch-hiking trip to Mt Kilimanjaro; I then borrowed it again in July 1960 when I went on a hitch-hiking trip through what is now Zimbabwe; and I borrowed it again when I went climbing in the Drakensberg the following year. Even though I used both my Yashica camera and my father's Lordomat camera on the latter two trips, my father obviously realized that the days when the Lordomat was his camera were numbered, so he wisely bought himself a new camera and generously gave me his old Lordomat, and I used it extensively – taking thousands of 35 mm colour slides with it from 1962 until 1974. The pictures that I took with the 35 mm Lordomat documented more climbing trips in southern Africa; my experiences as an AFS student in the USA; my travels in Europe in 1963 as well as during the three years that Heather and l lived in England from 1967 to 1969; my time as a university student in Australia; and Heather's and my first few years in New Zealand. They were important formative years, and one of things that I will always associate with my early adulthood is Dad's – umm, my – Lordomat. Eventually, however, I concluded that I needed two things that the Lordomat did not provide: I wanted a camera with a built-in light-meter, and I wanted a single lens reflex (an SLR) camera in order to know that the picture I was looking at through the viewfinder was the shot I was going to capture, and – as a result – in August 1974 I bought an Olympus OM1. It has been said that the OM1 was "a camera that set new industry standards in terms of functionality, portability and ease of handling when it was first introduced [in] the early seventies", and my Olympus OM1 certainly lifted the level of my photography dramatically. I still use photographs in my lectures that were taken with my OM1 on my first sabbatical leave in Scandinavia in 1976-77 (some of which were also published and several appear on this website. 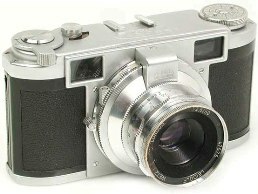 An Olympus OM1 single lens reflex (SLR) camera. "I have an Olympus OM1 camera and a range of lenses"
Utterly unexpectedly, my OM1 also took me to places I never thought I'd get to. In early 1979 I applied to be the Information Officer / Photographer at Scott Base in Antarctica. As I was then a Senior Lecturer in Political Science at the University of Canterbury in Christchurch, I thought I had very little chance of getting the position, so much so that when Heather drew the advertisement for the job to my attention, I commented resignedly. "I'll never get it", to which Heather pointedly responded, "Well, you won’t get it if you don’t apply for it!" That rightly spurred me into action, and I duly applied for the post, and my letter of application included a line that said, "I have an Olympus OM1 camera and a range of lenses." Little did I know that the Antarctic Division of the New Zealand Department of Scientific and Industrial Research (the DSIR) had not one but two Olympus OM1s, and that when the selection committee for the job looked at my application, Colin Monteath (who then worked for Ant. Div.) said, "Well, here's someone who can at least operate our cameras" (something that some of the previous Information Officer / Photographers at Scott Base had not been particularly skilled at doing). It certainly contributed to me getting the job. The four months that I spent in Antarctica (from mid-October 1979 to mid-February 1980) were among the most amazing of my life. Wherever I went, I carried three Olympus OM1s round my neck – one to take black-and-white photographs for the Antarctic Division of the DSIR; one to take colour slides for Ant. Div. 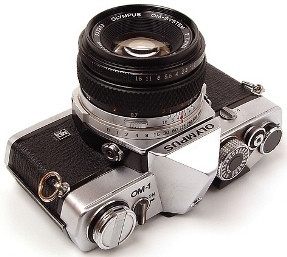 ; while the third OM1 (also with colour film in it) was my own. I took literally thousands of photographs, and – not surprisingly in view of my job – had a significant number of my black-and-white photographs published in newspapers throughout New Zealand. Even so, nothing could have prepared me for the circumstances leading to the most famous – and by far and away the most published – photograph I have ever taken. On 28 November 1979 an Air New Zealand DC-10, on a tourist sightseeing flight to Antarctica, crashed into the lower slopes of Mt Erebus. All 257 people on the plane were killed. Eighteen hours after the wreckage of the DC-10 was located, I was flown up to the crash site aboard a helicopter in order to take pictures of the crash for the New Zealand news media. When I got back to Scott Base and looked into the fixing tray as I developed the films I had taken, I saw the image of the DC-10's tail with its distinctive koru symbol on the snow- and ice-covered slopes of Mt Erebus. I knew immediately that it was the picture that in one simple image summarized the whole dreadful tragedy. Sure enough, it was published throughout New Zealand and the world. Indeed, the picture is still used to symbolize the tragedy that occurred on 28 November 1979, which was (and still is) New Zealand's worst-ever peacetime disaster. It's the photograph at the top of this page of my website. 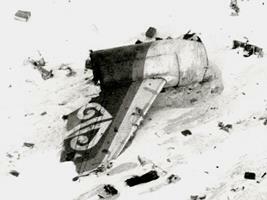 A review in the 22 October 2011 edition of the New Zealand Listener noted: "Nigel Roberts's picture of the DC-10's broken tail and koru emblem amid the snow remains one of the iconic images of New Zealand's 20th century." In my capacity as a political scientist, I have (for a period of more than thirty years) attended a large number of political meetings – both to study the behaviour and oratory of politicians and to examine the reactions of audiences attending the meetings. Not surprisingly, I've combined my love of politics and my love of photography by taking photographs at campaign rallies and political meetings. The first photograph I took of a politician was of President John F. Kennedy, when he was campaigning at a massive outdoor meeting in Cleveland, Ohio, during the 1962 mid-term elections in the United States (although, of course, I didn’t know it at the time, this campaign rally was held just hours before President Kennedy returned to Washington DC to deal with the Cuban missile crisis). 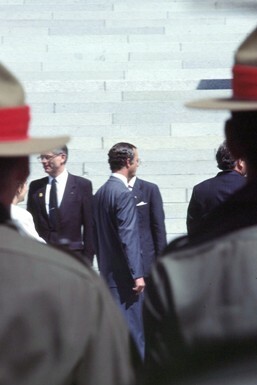 I was hundreds of metres away from Kennedy, separated from him by a throng of literally thousands of people. As a result, the President appears as little more than a dot in the photos I took on that occasion. Cleveland, Ohio, in October 1962. Thankfully, though, I became far more adept at getting closer to politicians and taking better photographs of them. For a start, I learnt that it's necessary to get to political meetings early (half an hour or more in advance) to secure a good vantage point. I also discovered that crowds (and even security officials) are prepared to give you a lot of leeway if you have a camera in front of your eyes. What is more, whereas partisan audiences often don't appreciate you not joining in the clapping and the cheering when you attend one of their campaign meetings as an individual (albeit as a non-partisan political scientist), they are quite prepared to accept your neutrality when you're photographing proceedings, and often go out of their way to give you a better view. As you will be able to see from the list of the contents in the side-bar to the left of this essay, I have a series of photographs on my website entitled Portraits of Power, so let me explain the circumstances that led to two of my better photographs of politicians. In 1976, I attended a Republican party campaign rally at Lewis and Clark College in Portland, Oregon. The main speaker was President Gerald Ford. During the evening, I worked out both when Ford's question-and-answer session was coming to an end and where he was likely to go after it, and I made a beeline for where I thought Ford would be heading. I was right. He came along the line where I was standing, shaking hands with enthusiastic supporters. I faced a moral dilemma: did I shake the hand of the President of the United States or take his photograph? In reality, this was no contest: of course I took his photograph! 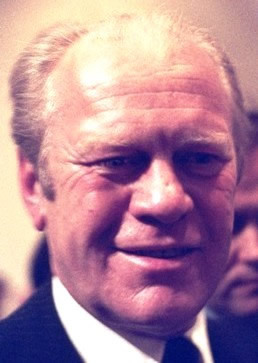 US President Gerald Ford in Oregon in 1976. Nine years later, I attended a Social Democratic party election rally in Göteborg (i.e., Gothenburg) in Sweden. As I inched my way forward – taking photographs as I did – getting closer and closer to the platform where Prime Minister Olof Palme was talking, a white-coated official stopped me and asked me what I was doing. After I told him, he exclaimed, "Ah New Zealand! Go up onto the platform." 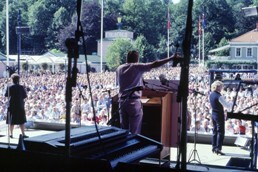 I duly did so, and as a result was one of only four people on the covered stage looking out across the large crowd that had assembled in the grounds of the Göteborg's Liseberg amusement park to hear the Swedish Prime Minister speak. 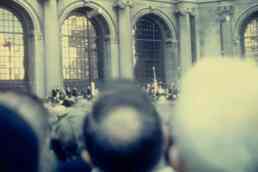 The other three people were the two deaf translators and Olof Palme himself – showing both just how easy it was to get close enough to Olof Palme to take some really good photographs and yet, at the same time, just how vulnerable the Swedish Prime Minister really was. Five months later Olof Palme was assassinated in the streets of Stockholm as he walked home from the cinema with his wife. Another important ingredient in political portraiture is luck. In addition to photographing politicians, in the 1970s I began photographing royalty as well (as my Portraits of Pomp show). I took some reasonably good shots of Prince Charles when he visited New Zealand in 1981, and was especially keen to get a good picture of his wife, Princess Diana, when she too came to New Zealand two years later. I slipped out of my office and went into town an hour or so prior to the scheduled start of the royal walkabout. I waited right next to the ropes along the route that the Prince and Princess of Wales would be taking. The crowd swelled considerably, but – given where I was standing – at least my view would not be obscured. When an American man tapped me on the shoulder and said, "Say, my little Emily can't see", I let his little Emily (a girl of about five) stand in front of me – not out of gallantry, but because Emily was so short that I knew she wouldn't prevent me from seeing or photographing the princess (Emily was so short, in fact, that her long hair kept getting caught on waist-level velcro on my parka!). 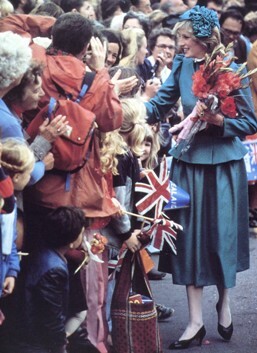 photographing Princess Diana in Wellington in 1983. "That's a lot of cameras for a little man"! My Portraits of Power and Portraits of Pomp photo-galleries include some of the photographs that I have taken of prime ministers, presidents, and politicians, as well as of royalty and, in the case of New Zealand, governors-general (who represent the monarch and are, in effect, the country's head of state). I have a definite hierarchy of priorities for including photographs in these galleries. My first priority is to include a photograph that I've taken of the person concerned (such as my photographs of Gerald Ford, John Howard, Olof Palme, and Queen Elizabeth II). If I haven't taken a photograph of a person in the flesh, so to speak, then I will include a photo I've personally taken of a statue – or of a sculptured bust or other similar likeness – of that person (the photographs of King George VI, John Gorton, and Michael Joseph Savage in my Power and Pomp galleries are relevant examples in this regard). And if I haven't taken a photo either of the person while alive or of a statue of them, then I'll include a photograph that I've taken of their grave (in this respect, see for example my 'portraits' of George Forbes, Norman Kirk, and Calvin Coolidge). If I haven't personally taken a photograph either of a person, or of a statue of them, or of their grave, then I will occasionally include a picture that I've taken from another source – such as my photo of the former Australian prime minister, Tony Abbott, which is a photograph that I took in April 2015 of a picture of him that was in the Museum of Australian Democracy in Canberra. In the case of my gallery of photographs of United States presidents, I have thus far – in one way or another – photographed less than two-thirds of America's presidents. However, rather than create a gallery with nearly as many holes as pictures in it, I decided to include photographs of images of some of the presidents that I took in 2004 while visiting an exhibition at the Minnesota Historical Society. One of my long-term aims is to replace these images (each of which is marked with an asterisk in my gallery of United States presidents' pictures) with photographs that I've taken myself. Talking of national leaders, it's at this point that I should admit that the King of Sweden persuaded me to make a radical break with respect to the camera equipment I used. Unlike the Princess of Wales, though, he didn't speak to me personally. Far from it: he came to New Zealand in 1989 and I went to photograph him as he reviewed an honour-guard of troops on Parliament Building's forecourt. I took along my Olympus single lens reflex camera and a 75-150 mm telephoto lens and stood behind the crowd-control barriers (not that the crowds were either large or needed controlling). However, King Carl XVI Gustav moved so rapidly along the lines of soldiers he had to inspect that I could almost never get him in focus in the viewfinder of my camera. The pictures I took of him were pathetic. New Zealand Parliament in February 1989. Then and there, standing in front of the New Zealand House of Representatives, I decided that – from that moment on – I would use a "point and shoot" camera (namely, a camera that would automatically focus on the subject in the centre of the viewfinder, and one that would automatically choose the requisite aperture and shutter speed for the shot). As a result, for the next 15 years I consistently used automatic cameras (beginning with an Olympus AF1 and later moving on to an Olympus AZ-200). Putting my SLRs behind me, I followed my father's example and gave my trusty old Olympus OM1 to my son, Evan. An Olympus AZ-200 "point and shoot" camera. A few years later, in 1991, there was another significant change in my photography. I took my Olympus AZ-200 "point and shoot" camera with me on a research trip to Scandinavia, followed by a trekking- and climbing-holiday in Nepal, and – as I'd done for more than 30 years – I used colour slide film. I took literally scores of rolls of 35 mm transparencies (so much so that the number of photographs I took became something of a standing joke amongst my climbing colleagues). However, when I had a selection of my Nepalese slides converted into colour prints so I could put them into an album along with some of the colour prints my fellow climbers had sent me, I was very disappointed by the quality of the prints. I consulted the Victoria University of Wellington photographers about the problem, and they advised me to use colour-negative film in order to get good quality colour prints. They pointed out that good slides could be made by photographing prints, whereas the converse was not (at the time) the case. I acted on their advice – and by the time I went on sabbatical leave in 1994 (a leave that took me to Scandinavia again, as well as on climbing trips to Russia and Argentina), I was an avid user of colour-negative film. I'm quite conservative. I tend to stick with the tried and true, and if something is working well and suits my purposes, I don't change my ways or my possessions (a prime instance of this is that I hate buying new shoes!). As a result, I was a late convert to digital photography. But in early 2004, I was so impressed by my younger brother's digital camera – both by what it could do and by what Stuart could do with it – that I decided to take the plunge. Naturally, my conservatism dictated that when I bought my first digital camera three months later, I bought the same type of camera as my brother (at least in part because a week after I bought it, I was going to visit Stuart and could get a free hands-on 'tutorial' from him about how to use the camera). 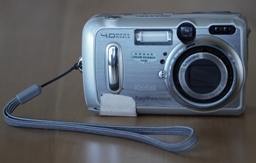 My first digital camera: a Kodak DX6440. The digital camera I bought as a sixtieth birthday present for myself was a Kodak Easy Share DX6440, and so – for the first time since I was eight years old – I acquired another Kodak camera. I used it for five-and-a-half years and loved it. It photographed legislatures and parliaments; great architecture; mountains and mountain climbers; several penguin species; family members and friends; prime ministers, presidents, politicians, and political party posters; and a host of other things as well. This website could not have been designed and developed without it. Thus, in a period of slightly more than 50 years, I had literally gone from Kodak to Kodak. You could have said I went full circle … except for the fact that I definitely did not love my Kodak Box Brownie camera! All good things come to an end, however. My Kodak DX6440 camera had a tough life. For several years, as the above photo shows, it had to be held together with sticking-plaster. That wasn't the cause of its demise, though; my first digital camera eventually had to be dicarded after its LED screen expired in October 2009. I wanted a better zoom lens, anyway, so in December 2009 I bought a Panasonic Lumix DMC-FZ35. It has a Leica lens with an 18-times optical zoom. Once again, I'm delighted to report, I'm thrilled with what I bought. What is more, this time my brother Stuart copied me: he too recently acquired a Panasonic Lumix digital camera. * my Kodak DX6440 digital camera: Evan Roberts. Finally, many thanks to Heather Roberts and to Steve Merchant respectively for the photographs of me taking photographs on Kangaroo Island and on Mt Taranaki. The picture of me taking a photograph at a John Edwards election campaign rally was published in the Minneapolis Star Tribune on 27 October 2004. Pages in the Photography section of my website were last revised on 15 April 2019.